Bulgari Omnia is the perfume equivalent of that charming-but-mysterious trans-clique chameleon from high school -- the one who moved effortlessly between theatre geeks and jocks, accepted by all, alienating none. Omnia, along with stablemate Bulgari Black as well as the likes of Hermès Eau de Merveilles and Thierry Mugler Womanity, manages to maintain the integrity of the attractive loner while still being sought after to turn any party into a bitchin' party. With its creamy, nutty, not-quite-sweet allure, Omnia is one I always recommend to both men and woman who want to smell “different” without smelling “weird”. P.S. Annoyingly, it seems that this original Omnia (brown bottle) has been discontinued, leaving behind its bereft-but-blander siblings Jade, Coral, Crystalline and Amethyste. See where integrity gets ya? I don't know this one, but according to LT and TS's perfumes:THE GUIDE, Omnia gave birth to Lubin's Idole and ELDO's Tom of Finland. It just sounds like a great mainstream designer release, which nowadays, appear to be very few and far between. Delicious review.I'm so sad that this was discontinued. I use my tiny little bottle with much caution :) I did a little immature review on it a while back. Sharing the link if you're interested. I like this one and had a bottle ...buuuuut.I get almost completely anosmic to it in 17-34 minutes flat.Grr. No ..it's not cause I didn't spray enough ,or that I had had it on long enough to wear off and NEED refreshing. No .I had marinated in it (Something like 17 sprays thinking it must be a soft tea scent)I could barely catch a whiff from snuffling my arm or my hair -but apparently I was wafting at least a ten foot radius around myself at work. Mom got my bottle ( as well as a backup or two as gifts).Interestingly she also likes Womanity,and Dad has adopted Bvlgari Black(and eau Rouge as well as Puig's Quarum) as his main three fragrances . Omnia reminds me a bit of Absolu by Rochas and Covet by SJP. What a splendid-smelling family you are! Love it! Omnia started my love affairs with ginger and cedar notes. I love this perfume, I think it is very ummy and what is your personal fav. perfume by Robert Piguet and Eau d’Italie ? I'm loving Tom Ford's Grey Vetiver. It smells like Liam Neeson's beard. Can you please, please, please review it? I don't want to take away from this interesting post and its comments, but I would like to take a moment to publicly apologize for my "lying poseurs," comment from a couple posts ago. I realized the next day just how rude it sounded and I am genuinely sorry. I certainly hope that I didn't hurt the feelings of the person who wrote in with his question. But at the same time, there is something about Philip's fragrance tastes and how he describes them that really just doesn't add up. I mean, c'mon Philip, you say you want something rough, dirty and manly, and then you go and name the most vanilla (and I'm not talking about vanilla as an ingredient) scents around like Grey Vetiver. Also, the original question is a confusion in that it ellides three very different fragrance areas- the clean scents of Ellena, highly feminine indolic florals, and extremely masculine scents. Though having watched a couple of your very funny videos on youtube I can see how your interest in presenting an alternative reality to people is all part of your charm- there is a reality of what the fragrances you actually like, are like, and that seems to be much more polite than you envisage and communicate, and the statements of liking filth and so on do seem a bit of a pose. If you like pretty florals and gentlemanly scents Philip, just admit it, there is not necessarily any shame in being a conformist: your perfumery choices do not have to be all metaphorical cow costumes, and metal hats to project you from alien rays: if in terms of the olfactory you want to wear either a lovely summery dress or a nice business suit, that's o.k. too. Anonymous, I would assume that like many of us, Philip enjoys a wide range of different fragrances. After all, it's hard to go to the dark side every day. But at the same time, I can't help but feel that you published Philip's request on your blog because it just doesn't add up, as myself, Nora and Dan in his response all pointed out, and I'm sure you must have felt that in then also deciding to publish Dan's commentary to this effect, on your blog. And in terms of Nora's identifying him as a poseur, based of what I've seen of his videos on youtube, that's actually very accurate and might explain the gulf why his description of what he likes and how it is commonly perceived does not add up, because, based on the fragrances he has named as liking, his tastes seem pretty conventional. "And in terms of Nora's identifying him as a poseur,"
Could we please put my jackassery behind me? 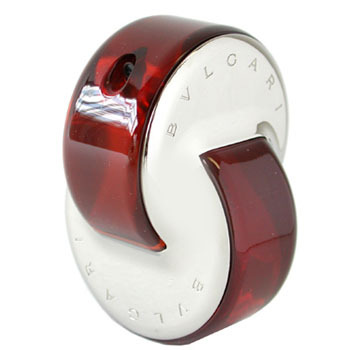 Um, yeah, so this Bvlgari Omnia, I'm LOVIN' it! I'm a little confused by the use of "you," and "your," in this post. The second and third sentences seem to be directed at Phillip, but I'm not sure if the fourth sentence is referring to him as well or to Katie? Does he also have youtube videos? Anyway, I'd like to mention that people will sometimes get very different things from fragrances. It's like looking at different sides of a sculpture. It's entirely possible for someone to get filth in the clean scents of Ellena, or body odors. We all have different noses and different brains and different experiences. Katie and Dan once described Odalisque as being very lily-of-the-valley, whereas I was hit by wintergreen the first time I smelled it. Love, Chloe smells like pickles to me. Cinnamon essnetial oil seems bread-like. Fracas reminds me of hairspray. Kelly Caleche smells like new carpet, crushed papaya seeds and on wool reminds me of cat pee. I do not get leather and flowers out of this fragrance at all, just those things. I was a little dubious of monsieur's opinion, but I shouldn't have turned it into an opportunity to devolve into a 12-year-old discussing the veracity of other kids' favorite punk bands, and I am very embarrassed. Philip's original question didn't make any sense to me, so when Katie posted a link for his videos I watched a couple, and only then did its not making sense make sense. He has a very dadaist sense of humour, and in a way you hit the nail on the head in calling Philip a poseur, because taking up an extremist position as a pose is a dadaist tactic. In particular I refer to the very brave video where he is protesting alongside a group of anti-gay protestors, as means of satirising their protest. But at the same time, based on the scents that he has referred to, I don't feel that his perfumery taste is similarly dadaist, because there are scents that could be categorised as that, and they don't seem in what he has so far quoted to fit with his personal tastes. Here is the link that Katie posted. Oh yay! Omnia needs fans and love. I'm glad a bottle of it has found a loving home. Hello, I just discovered your review, I was sent an email from Groupon for the Bvlgari Omnia eau de parfum $25. so I just grabbed it. I'm so thrilled, love it. It was written in the stars, Anonymous! i agree it should still be sold,my wife loved it and now its gone...the perfect aroma on the perfect woman.